Problem: How to best load comments on cached Pages? I recently added commenting to my WordPress blog. Comments are dynamic, and change more often than the blog article content itself. I needed a way to guarantee users would see the most up-to-date list of comments despite the rest of the page being cached. I researched ways to serve dynamic / user-generated content on static cached pages. Many of the options included loading content asynchronously in the browser, or using targeted cache invalidations whenever new dynamic content was created. Output dynamic content with the web page (default) – content is cached with the web page, and the page cache is invalidated whenever new dynamic content is created. Load dynamic content over AJAX – load content after the page has loaded from a REST API that does not have caching enabled. I favored the third option because it provided a way to cache the dynamic content (improving the performance and scalability of the site), displayed it immediately on page load (possible UX and SEO implications), while still ensuring the content was current. In addition to being the most robust, this option also required the most effort to implement.. Comments Template (PHP) – generates the HTML for the comments container and the comment submission form. I made a few adjustments to my theme’s functions.php file to accommodate this solution. The WordPress hook I used here is a great place for any custom pre-processing that may need to be done on user submitted comments. I configured WordPress to send email notifications whenever new comments were made. Following this guide allowed me use the Gmail SMTP Server when sending emails from WordPress. I adjusted the “Allowed HTTP Methods” to include POST requests to support the new comments submission form. 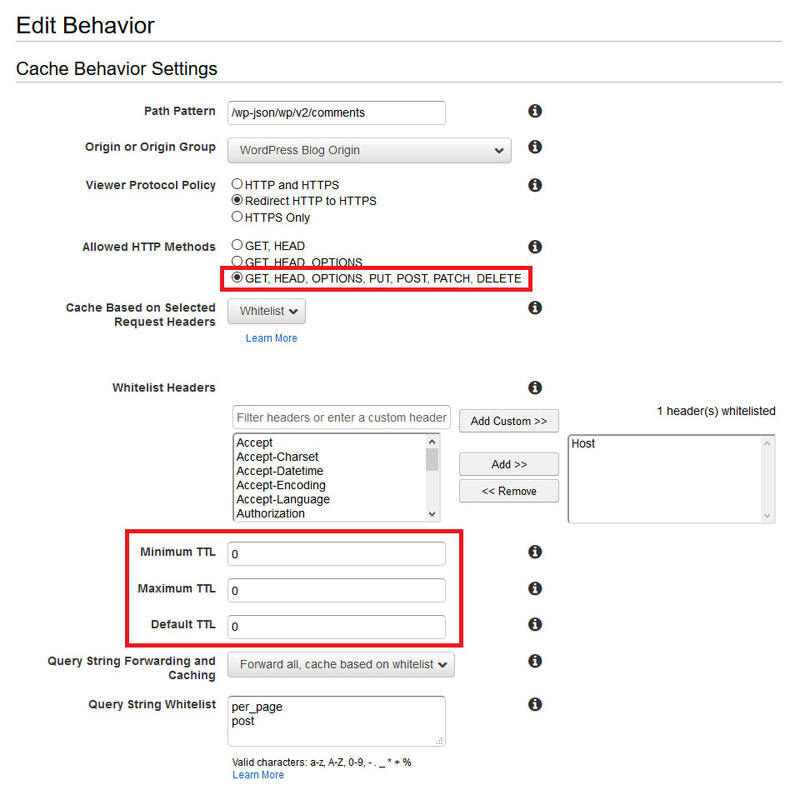 I also adjusted the TTL settings to 0, which essentially told CloudFront not to cache any of the requests handled by this behavior (more information on setting TTLs is available here). There has been a lot of discussion over the years about if Google does truly index content loaded over AJAX. While many people say yes, and specifications for doing so have been created (and deprecated), it is probably safest to serve all content that is relevant from an SEO perspective along with the page.